In January 1873, the SA Government called for tenders to build a stone bridge over the Little Para River , also the making, metalling and fencing the approaches. The contract was let to a J Coad of Chain of Ponds on 11th March 1873. He was to receive 684 pounds 10 shillings and the job to be completed by 1st July 1873. There was a penalty clause of 2 pounds per day if he failed to complete the work on time. Apparently the penalty clause was not enforced, because Coad was paid on 20th February 1874, the actual cost including extras being 724 pounds 5 shillings. 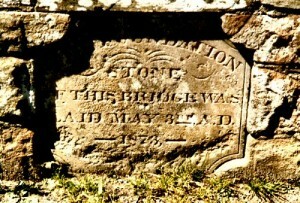 The Foundation Stone was placed by a Miss McEwin on May 3rd 1873. The bridge was duly opened on Wednesday 11th February 1874, amid due pomp and ceremony, and the “Register” on the following day reports at great length on the activities at Snake Gully on this great occasion. 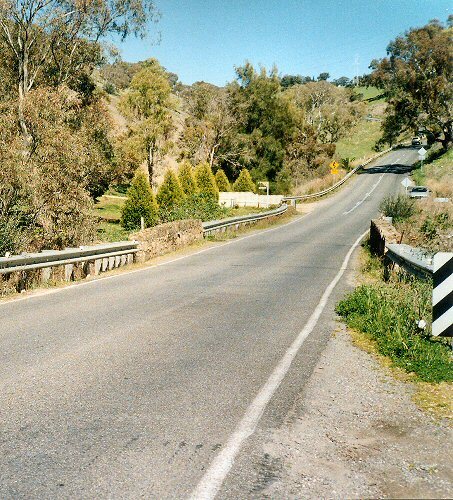 For many years the want of a bridge over the Little Para, on the Golden Grove and Sampson Flat Main Road , has been felt by the residents of the Tea Tree Gully district whose farms are situated near the stream. The road is one that was put upon the schedule of main lines after some severe fighting. It leads from the Main North Eastern Road, near Modbury, to Smithfield and One Tree Hill, and is also the most direct road to the Barossa Diggings and the other gold fields in that vicinity, being, it is stated, 10 miles shorter than any other. It is largely used by farmers and others living on the north side of the river, who prefer carting their wheat to the city to conveying it to one of the Railway Stations on the Northern line, where it has to be shifted into the trucks, and considerable traffic is caused by the carriage of firewood into Adelaide . The Snake Valley Crossing is the only one on the Little Para between the Old Spot (near Salisbury) and Inglewood, and the said crossing being a rather bad one it was only natural that people interested should bring all the influence they could to bear upon the powers that be, in order to obtain a bridge that would enable them to get across the river with safety at all times. With the object of convincing the House of Assembly that a bridge was necessary, a number of the members of that body were invited to a sort of picnic at the Gully of Snakes about two years age, and the arguments then brought to bear at the excellent luncheon provided by Mr Gaylard appear to have been quite convincing; for when Mr Ward brought the matter before Parliament he was successful in obtaining a vote of a 1,000 pounds. Snake Gully is no doubt a very nice place on a cool day, but the weather there was decidedly warm on Wednesday, February 11th, the day fixed for the opening of the bridge. It is certainly a very beautiful if a rough spot. It is surrounded by lofty hills, whose steep sides are covered with grass, and dotted with grand old rocks, seeming as if they needed but a touch to send them hurtling down among the trees below; while at the foot of the mountains the channel of the Little Para – a dry channel, alas! In many places-winds between masses of green vegetation, which is very refreshing to the eye where all else is withered. The roads leading to this truly picturesque spot are none of the best. The line from Modbury is made in some places, but in others it is both heavy and rough, and just before reaching the bridge you have to descend a hill which is, from its steepness and narrowness, and the absence of a fence, most dangerous to travel upon. The approach on the other side is as bad, and money could be advantageously spent both north and south of the fine structure that now spans the stream. The bridge has a substantial and almost a handsome appearance. It is made completely of stone and has a span of 24 feet, the width of the roadway between the parapets being 20 feet 4 inches. It has Scotch coping, parapets and wings, and the arch, which is of freestone, is 21 feet above the stream. There are embanked approaches on both sides. The stone used in the work was obtained in the immediate neighbourhood, and the lime was made from Mount Torrens marble, obtained from the property of Mr Turner. The bridge was erected out of a vote of 1,000 pounds, which was derived from the sale of Treasury bills. Its construction was put into the hands of the Central Road Board and the work has been planned and carried out under the superintendence of Mr C F G Ashwin, one of their Surveyors. The contractor was Mr J Coad, and the cost has been 800 pounds. The balance of the grant, however, can be very usefully applied in the immediate vicinity of the erection. The foundation-stone was laid in May, 1873, by Miss McEwin, a daughter of Mr R McEwin, who is an old and much-respected settler in the neighborhood. The contract should have been finished much earlier, but Mr Coad was delayed from various causes and it was only just last week that the finishing stroke was given. It was appropriately arranged that the opening ceremony should be performed by Miss Gaylard, the daughter of another gentleman who has during his long residence in the district won much respect and a large crowd of people assembled to celebrate the affair. Indeed, it was a matter for wonder where everybody came from, for there must have been several hundred persons present. At about a quarter to 2 o’clock a procession was formed at the southern end of the bridge. Miss Gaylard was introduced to the assemblage by Mr Ward, MP and having broken a bottle of wine on the causeway, declared the bridge to be open for public traffic. The people then passed over and the career of the Snake Gully Bridge was thus successfully inaugurated. Luncheon was provided in a marquee on the ground and was catered for by Mr J Butler of the Modbury Hotel. The tent was decorated with the inscriptions – “Welcome to Snake Gully” and “Advance Australia.” Mr Percival Gaylard (Chairman of the Tea Tree Gully District Council) occupied the chair and Mr Joseph Daw (a member of the same body) acted as Vice-Chairman. The loyal toasts were proposed by the Chairman and duly honoured. Mr R S Kelly, JP proposed “The Parliament of South Australia” – a body of men who were often blamed and often praised; but he thought they did the best they could and they were exactly the kind of men whom the electors put in to do their business. He could not enumerate all the good things they had done; but they had done one good thing in granting the money for this bridge. (Cheers) The members for Yatala and Gumeracha had struggled hard to bring it about, especially those who were present that day. (Hear, hear). Mr Ward was the principal hand in bringing the matter forward and Mr Cavenagh; who was then Commissioner of Public Works, put it down as a special grant and that was how they got the bridge. (Hear, hear) If there had not been a special grant he did not think they would have had that gathering that day, because the Central Road Board would not have taken the trouble to make it. Mr Wentworth Cavenagh, MP had very great pleasure in returning thanks for the Parliament. Of course it was a great pleasure to members who gave a large amount of time and attention to public affairs to find that in social gatherings like this the Parliament was generally proposed and the toast was received with acclamation. The Parliament was a reflex of the people and if the Parliament was to blame, they were to blame for electing them. Many things were due to the Parliament of South Australia – the Real Property Act, roads, railways and last but not least the Land Act. He dare say there might be a difference of opinion as to the liberality of the Land Act, but under it anybody could take up land and it had been the means of settling a large extent of country. (A voice – “Thanks to Mr Ward”) Considering that he (Mr Cavenagh) was one of the members who brought in the original Act – perhaps before Mr Ward had a seat in the House – he did not know that that was the case; but he did not wish to go into politics. In a short time there would be a new Parliament and if they had anything to complain of with regard to the present members the matter was in their own hands. No doubt in every Parliament there were geese who considered themselves swans – (laughter) – but it was for the electors to rectify that. (Hear, hear). Mr Ebenezer Ward, MP also responded. When he told them that for some time past he had been looking forward to this day with considerable anxiety they would believe that he attended with considerable pleasure. When they met under the leaves of a gum tree some two years ago and ate the pleasant lunch provided by Mr Gaylard, he even then looked forward and hoped he might be spared to have the pleasure of meeting with them when they celebrated the opening of the bridge. That day had arrived and he thought they were all well pleased to think that the social gathering he had mentioned was not altogether thrown away. 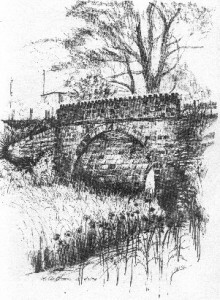 Mr Gaylard, wanting the bridge as much as he did – (laughter) – and finding it of much value would rejoice as much as any single person there at the accomplishment of the object, and he was glad that a daughter of his was present to perform so well, the duty of opening the structure. He believed that Mr Gaylard would be considered, not only the father of the young lady but the father of the bridge. (Laughter). There was one matter at which he must express his extreme regret, for he found that he must lose Messrs. Gaylard and McEwin, who had hitherto voted in Gumeracha owing to a misapprehension as to the boundary and that Mr Cavenagh gained them. He thought it was really too bad and that Mr Cavenagh got the best of it. (Laughter). A great many people thought that because he was living up in the North he was going voluntarily to sever his connection with the district, but he never had the least idea of such a thing. He believed that he could serve the district as effectually living at Kapunda as at Adelaide and at the next election if the voters did not choose to return him that was their own affair, but at any rate he would give them the opportunity. He never did dream of leaving the old district. They returned him when others would not have done so and although some other constituencies might be willing to return him now he was not going to run away because of that. He thought that representatives and constituents who knew each other were better able to work together than others. He thought it was better for a man to stick to the one district that knew him rather than run about to others and if they who knew him did not choose to return him it would be in his opinion an expression of opinion – and a very strong expression that he should not be in Parliament – and he would be content to abide by the result. They had a good land or rather water-mark in this bridge and he trusted that he might be spared to see many monuments of the kind erected in the district of Gumeracha. It was not generally known that as the result of a conversation with Mr R S Kelly he had obtained a vote of 3,000 pounds for the construction of a direct road from Ardtornish to Port Adelaide.In the absence of recognition of a thing of this kind a public man was likely to feel discouraged and they should let their members know that they were not forgetful. There were some members of Parliament who assumed a high moral ground – he thought there was a great deal of humbug about it – (laughter) – and said they would not have any log-rolling – they would put a thing to the House on its merits and have it carried on its merits, or they would stand aside. As a matter of principle, nothing approaching log-rolling should be tolerated; but if under the present Constitution they could not get on without log-rolling, it was better to have that than no roads, and as long as he represented that or any other district he would endeavour to get what was required even if he had to do a little log-rolling. It was this – one member put a motion on the paper and if he did not give any information about it to members they thought it was a good opportunity of appearing to be economical and voted against it. The case was not decided upon its merits because it was passed over without being understood; but if they did as Mr Gaylard and others did – invited the members out and showed them with their own eyes the necessity of the work and got them into a good humour with the lunch afterwards – if they called that log-rolling he did not care; but it was a very good way to get what they wanted. (Laughter). He could assure them that he worked behind the scenes for this bridge and it was a fortunate thing for both districts that Mr Cavenagh was Commissioner of Public Works at the time. If the present Commissioner had been in office he did not believe they would have got the vote – because a man in office who chose to befriend a district could do so much better than those who had no Ministerial power. The line was placed in the schedule of a Bill that was brought in; and he thought there was this amount of log-rolling with members who were interested in other lines that they thought, “If we knock off this bridge Ward and those fellows will knock something off our works.” (Laughter). Mr Playford, when in the Road Board, had said the bridge would be a waste of money, but they had got it and he had no doubt it would be useful. As to the Land Bill he would say that it was not done with yet – he would have another fight when Parliament again met. The Vice-Chairman proposed “Success to Miss Gaylard and the Snake Gully Bridge .” The work, which would be an everlasting boon to the district had been initiated by Mr Gaylard, and Mr Ward, with Mr Cavenagh, had been the great means of getting it carried out. If any member deserved their thanks it was Mr Ward who had done great things for the district. Mr P Gaylard, in responding, said he had done nothing more than his duty in working for the district in which he had the honour to reside. He should have liked to have seen there that day Mr Playford, who in his last dying speech and confession at the Road Board – for he did not believe he would be returned again – said the bridge was a waste of money and was being built for two men only. He would like him to be present to see if that was the case. He hoped they, as men of influence in the country, would take note of Mr Playford’s statement and place on the Road Board men w2ho were able to represent the country and were not non-sided individuals. Mr W Haines, the Secretary, here announced that he had received letters of excuse from the Hons A B Murray, MLC, L Glyde, MP (Treasurer), H E Bright, MP (Commissioner of Public Works), Messrs A Hallett (Chairman of the Central Road Board), H T Morris and R J Andrews (Secretary to the Central Road Board). Mr Trestrail gave the toast “The Members of the Central Road Board and may the Government find them plenty of funds to maintain the roads.” He believed that the members of the Board, which had been established by the instrumentality of Sir R D Hanson, had been the means of a vast amount of good to the country districts. He was sorry that Mr R S Kelly, who was one of the best members and Mr McEwin were not on the Board. Mr J Morris responded on behalf of the Central Road Board. Mr John Robertson, JP, proposed “Mr C F G Ashwin, and may he be long spared to be the Surveyor of the North-Eastern District.” He thought the roads of this country would bear favourable comparison with those of Britain . The first thing that struck a new-comer was the extent of good roads. This was owing to the Central Road Board and those who acted under them. He had felt great pleasure in meeting Mr Ashwin that day and he thought that by his conversation with him he had been the means of rectifying some grievances which were felt in the neighbourhood. Mr C F C Ashwin, in response, expressed his pleasure at the satisfaction he felt in the district on the completion of the bridge, which would be standing when all in that tent were gone. As to special grants, he did not think that the Surveyors had ever been consulted as to the probable cost of the work. They found a certain amount of cloth and had to cut their coats accordingly, whereas if a few hundreds more had been voted, they could have given very different designs. Mr J Coad responded, stating that he done his best to make the bridge a strong one and expressing the hope that it would last for ever. The toasts of the Committee, the Ladies, (proposed by Mr R McEwin and responded to by Mr W J Lithgow), the Press (proposed by Mr Cavenagh, MP), the Chairman (given by Mr Wilson), the Vice-Chairman, the Host and Hostess, and the Secretary having been honoured, the company separated.